More than 100 kites are flown in the sky over the Nakatajima Dunes, one of the three largest sand dunes in Japan, which overlooks the Enshunada Sea. Here you can see many large kites measuring 3.5 meters by 3.5 meters. Then to the sound of the trumpet, the fighting starts. Making the 5-mm thick hemp strings intertwine, the kite-fliers try to cut their opponents' strings by friction, which is very exciting to watch. The strings burn, giving off a scorched smell. You can try flying a kite yourself in the grounds adjoining the shuttle bus terminal. Don't miss this opportunity of experiencing the actual sensation of flying a kite high in the sky. This festival dates back to the 16th Century when large kites were flown in celebration of the birth of a baby son to the Lord of Hamamatsu Castle. 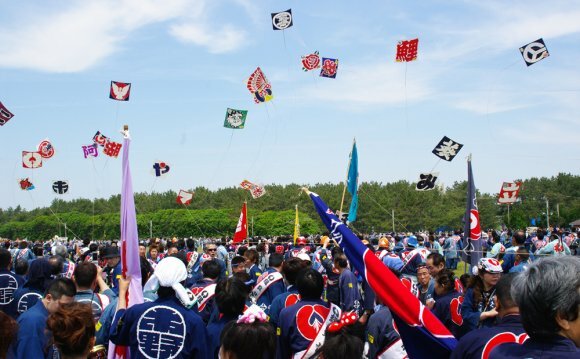 Even today, kites are flown at Hamamatsu when a baby boy is born, a custom known as hatsudako. On May 5th, a festive day to pray for boys' good health and a bright future, it is the custom in Japan to fly decorations called koinobori, which are carp-shaped streamers. Carp are known to swim up waterfalls and this powerful image of the carp overlaps with the image of advancing in one's career. In Hamamatsu City, koinobori are displayed in a grand style, with the carp streamers flying on wooden poles as tall as 10 meters. At night, you will see some 100 palace-like floats in the center of Hamamatsu City. This is a parade of floats of gorgeous sculpture works carrying three-stringed lute and flute bands. This was originally a parade welcoming youngsters returning from the kite-flying contest. All these events are organized as part of the Hamamatsu Matsuri (Hamamatsu Festival). During the festival, all kinds of entertainments are organized in all parts of the city including Act City in front of Hamamatsu Station. [Bus]A shuttle bus departs from JR Tokaido Shinkansen's Hamamatsu Station.